K-Laser - Lifeforce Chiropractic, Inc.
A: Low laser therapy devices are class III lasers whose powers range from 5 milliwatts to 500 milliwatts. The K-Series is a high-powered therapy device with power adjustable from 100 milliwatts to 12,000 milliwatts allowing for a wide range of treatment protocols. This power and penetration of the K-Laser system is not attainable with cold laser devices. By far the most obvious and fortunate conclusion we have been able to extract from in vivo studies (not only with respect to laser phototherapy) is that our immune system is capable of handling an extraordinary range of pathologies. The time scale and degree to which our cells can react and combat these contaminants is the subject of much study, but it is clear both that lasers do stimulate the immune system and that the restoration of healthy function continues well after the initial irradiation. The amount of healing done during the minutes of laser irradiation is minuscule compared to the time it takes to relieve the body of disease or infection. This leads to one very important piece of information: the body does most of the work itself and so the target for an effective laser treatment is NOT the pathology itself, but rather to stimulate the appropriate cell compartments that lead to the body’s natural repair mechanisms. Basically, we want to stimulate the cell’s metabolism (i.e. its ability to use oxygen to create energy). There are about 1000 different types of bacteria commonly present in the human body most of which reside either on the skin, or in the digestive tract. Of these, only about 10% are maintainable in cell culture and able to be studied. Some are beneficial (e.g. those that aid in digestion of food) others pathological. With this wide variety of species, never-mind their different functions and chemical signatures, it is prohibitively difficult to target any individual candidate or even to make the generalization that these candidates are more abundant than any other with respect to a particular pathology. Instead we can capitalize on one common feature in most bacteria: they do not like oxygen. Most bacteria are anaerobes that proliferate and metabolize much better in the absence of oxygen. Fortunately, this is in direct contradiction with the way our cells flourish and so stimulating the oxygen intake and conversion process will simultaneously help our healthy cells and inhibit bacteria. The most fundamental thing to keep in mind is that the cell (and the body as a whole) is comprised of more than 80% water. The variation in water content between different kinds of cells (with the exception of bone cells) is negligible and so laser therapy as a whole is highly non-selective. Cells do, however, contain some heavier elements that can act as a contrast agent against water, and which can therefore be targeted with laser radiation; the most relevant examples are iron and copper. Not surprisingly, these elements are the ones that exist at the core of the two most important photoacceptors in the body: hemoglobin at the core of blood cells and cytochrome c oxidase in the mitochondria. By and large these complexes are the principle absorbers of mammalian tissue by light in the near infrared (NIR) range of the electromagnetic spectrum (other than melanin in the skin). As such, and before any attention to their function, the characterization of absorption of these complexes was of paramount importance, and the subject of much study. Action spectra (i.e. the dependence of wavelength on absorption) have been generated for these (and other) targets in vitro and the peaks have been isolated and correlated with the biologically state of these complexes (see sectionUnderstanding K-Laser’s Success). The action spectra tells us where in the spectrum and at what rate laser radiation is absorbed by these chromophores, but we must address the biology of the cell to understand the subsequent chain of events that lead to a beneficial, curative result. As discussed earlier, the central goal is to stimulate the cell (and ultimately, the body) to perform its natural functions, but at an enhanced rate. These natural functions are not only extremely numerous (ranging from protein synthesis to enzyme secretion, from cell signaling to physical movement) but also highly cell-type dependent. Any attempt to directly target one of the multitude and variety of these specific enzymes is difficult, and fundamentally unnecessary. If instead, the metabolism, specifically the respiratory chain, can be stimulated, the cell will enhance the functionality of all of its natural processes. Fortunately, both hemoglobin and cytochrome c oxidase are involved in cell metabolism and their roles in the respiration chain are linked. Hemoglobin is the molecule, at the core of red blood cells, that transports oxygen through the body to the cells. When it reaches the cell it has to be de-oxygenated or “reduced”. The oxygen is then passed through the cell membranes and into the mitochondria where it is processed by a series of enzymes, the last of which is cytochrome c oxidase. Here the oxygen is again “reduced” as it is converted into water; this reaction is the stimulus for the enzyme ATP synthase to create ATP, the source of chemical energy in cells. This is the reason we need oxygen, slightly more in depth than “to breathe”. Zooming out to the big picture, hemoglobin carries the oxygen through the blood from the lungs to the cells. It has to be reduced and the oxygen flows through the respiratory chain to the terminal enzyme, cytochrome c oxidase, which then reduces again to create energy for the cell. Think of the hemoglobin as the faucet that governs the rate at which oxygen flows into the cell and cytochrome c oxidase as the drain that determines the rate at which oxygen can exit the cell in the form of ATP (energy). To optimize efficiency of the flow of oxygen through the respiratory process, the most appropriate course of action would be to open both the faucet and drain as wide as possible (opening one without the other would not increase the overall throughput); that is, stimulate the amount of hemoglobin that reaches the cell, the rate at which it reduces its oxygen, and then the rate at which the cell can process that oxygen and output energy. The goal then is to increase local blood circulation, stimulate the reduction of hemoglobin, then stimulate both the reduction and immediate re-oxygenation of cytochrome c oxidase so the process can start again. Recall the first goal of an effective therapy was to increase the amount of oxygen available for the cell to process. This means increasing blood circulation since the hemoglobin in red blood cells are the transporters of oxygen from the lungs to the cells. On the macroscopic scale, this relies on increasing the heart rate, which in turn slightly increases body (and blood) temperature. This is why exercise is good therapy for almost any ailment; increasing blood flow increases metabolism and stimulates the immune system. Locally around a wound, however, topographical heating does very little, resulting in neither an increase in circulation nor metabolism. This type of thermal effect is not the mechanism for laser stimulation of circulation. Laser irradiation instead creates local temperature gradients; that is, temperature differences on the molecular level that create potentials along which blood cells are more likely to flow. The stronger and more numerous the gradients, the more local circulation of oxygen can be stimulated. What is the most efficient way to cause these temperature fluctuation? Recall that the cell is more than 80% water. If you can target the absorption of water by a particular wavelength of radiation, you can cause local resonances that reinforce themselves. In the entire NIR region (i.e. from 700-1000 nm) the strongest and most distinct peak in absorption is at 965 nm; the right side of Figure 1 shows the absorption spectrum of brain tissue in the NIR. Look whose laser sits right at that peak!! Once the increased circulation gets the blood to the cell, the hemoglobin that carry the oxygen in the blood have to drop off their oxygen supply. Oxygenated and deoxygenated hemoglobin have very distinct signatures in the NIR. We are not concerned with the process of re-oxygenating the hemoglobin, because this occurs in the lungs. Instead we are interested in the absorption spectrum of oxygenated hemoglobin HbO2 whose deoxygenation can be stimulated by the absorption of a photon of radiation.Figure 1 shows the rather broad peak that covers the higher end of the NIR, where both K-Laser wavelengths reside. As discussed earlier, the terminal enzyme in the respiratory chain of a cell, cytochrome c oxidase, is the principle absorber of radiation in the entire cell and governs the rate at which oxygen is processed into ATP. Unlike the one-way deoxygenation of hemoglobin, cytochrome receives and delivers its oxygen in cycles within the cell and so we need to stimulate both processes in order to maximize efficiency. It turns out that laser irradiation does both, depending on the oxidation state of the enzyme. When deoxygenated, laser irradiation will stimulate oxygenation, and vice versa [redox]. 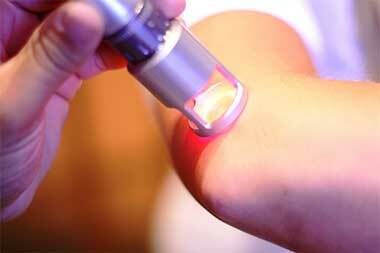 This effect has resounding implications and is thought to be the universal validation of laser therapy. The different oxygenation states of this enzyme have peaks throughout the visible-NIR spectrum, which is why virtually all wavelengths used have shown to be useful. K-Laser goes one step better. Laser phototherapy with wavelengths throughout the NIR spectrum enhances cellular metabolism, but there exists a peak in the absorption spectrum that can maximize this effect. Figure 1 shows the difference spectrum in the absorption of oxygenated vs. deoxygenated cytochrome. Remember, when the enzyme is either fully oxygenated or fully deoxygenated, irradiation will push the cycle along in the right direction, so we want to stimulate the process at both endpoints. The peak in the difference spectrum reflects the wavelength at which laser irradiation will have the greatest effect to change the oxygenation state, which will subsequently turn the wheels on the cellular metabolism most efficiently. This is analogous to firing the spark plugs at the exact time in the engine cycle to get the maximum effect. Notice in amazement that the shorter wavelength of the K-Laser sits right at this peak in absorption. The wavelengths employed by K-Laser are fine-tuned for success. We have one wavelength (970 nm) that coincides with a peak in water absorption; again the cell is 80% water and so this will have the effect of most efficiently creating temperature gradients that will increase local blood flow and therefore oxygen flow. This wavelength, along with the other at 800 nm, lies within the broad peak in oxygenated hemoglobin absorption; this means once the blood gets to the cells, K-Laser irradiation will most efficiently stimulate the passing of oxygen from the hemoglobin into the cells for use in metabolism. Finally, the 800 nm beam lies at the peak in the cytochrome c oxidase redox cycle; once the oxygen is in the cell, K-Laser irradiation will most efficiently stimulate the cyclic process of using and replenishing oxygen, thereby maximizing the ATP (energy) throughput of the cell. Remember, the name of the game is oxygen: getting into the cell, getting the cell to use it faster to make more energy, and then letting the cell’s natural processes boost the body’s immune system. This will result in curative and analgesic effects upon every administration of treatment as well as continued relief in the future. 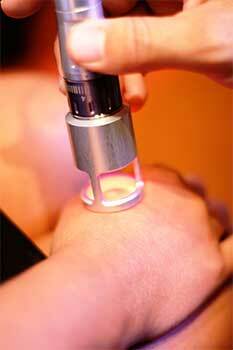 Analysis of in vitro results have pointed out that K-Laser’s wavelength range optimizes absorption and biostimulation. In vivo studies, however, suggest that there may be more to the story, and since our aim is to treat beyond the Petri dish, we must take into account the other parameters involved in phototherapy. Many clinical trials have been done with different values of power density and frequency modulation, with a wide variety of results. Much of these effects are highly specific to the condition treated. Any attempt to make broad generalizations that one specific power setting or pulse length is the end-all-be-all is irresponsible. This doesn’t stop most salesmen of competing lasers from assuring their clients that their product is the “magic wand”. We continue to be honest with our customers about what we do and do not know. Accordingly, we point our users to the relevant literature for their particular field for the optimum parameters. Even still, the most important advances in the history of science have come from trial and error, and as such, the adjustability of K-Laser’s power density output and frequency modulation is hugely advantageous. This machine does not offer a simple two- or three-mode variability, but rather several orders of magnitude in both parameters. With the power output ranging from 1-12 Watts and the beam size tunable from 1-5 cm2, our power density output is fully adjustable through the range of 200-12,000 mW/cm2. This combined with our frequency modulation potential of 1 – 20,000 Hz (along with the continuous wave (CW) capability) provides the most complete coverage of the therapeutic region available with any commercial laser on the market. Our field is still young, and we do not claim to have a complete understanding of all the mechanisms. Instead, we give our clients the ability to use any parameter set they wish. We also use their feedback to give future customers a more refined view of which modalities are most successful in the clinic. Comparing lasers to each other must therefore include more than just power density analysis. No other laser manufacturer on the market gives a full dosimetric profile of their beams. K-Laser provides a full 3-dimensional beam profile of both wavelengths at several power density and frequency settings; Figure 2 is an example of such analysis. From these profiles and a detailed analysis of the optical properties of the different types of tissue, we calculate the necessary treatment distances and times for a substantial number of therapeutic regimens. Also, if the client has a specific need to model a different anatomy, we can customize a treatment plan to yield the best results. FACT: Laser phototherapy, if administered by someone trained in the art, is beneficial in almost all of its forms and has no adverse side effects. The differences between commercially available laser units lie solely in the wavelength, power density, pulse modulation, and aesthetics. From these parameters, you can derive the penetration depth, dose distribution, treatment time, and the estimated biological effect. There is NOT a “magic” wavelength or setting that is the cure for a disease, and to claim otherwise (as many distributors or salesmen do) is irresponsible. There are, however, certain operating regimes that give better results than others and are more effective for particular symptoms. The select few modalities, atop which K-Laser finds itself rather lonely, that have been specifically designed to isolate and capitalize on a fundamental therapeutic mechanism, have continually proved successful in the clinic. And since the primary mechanism of action is the stimulation of the body’s natural anti-pathological immune system, the range of symptoms for which this laser is useful knows no bound. No other laser company offers more versatility in treatment modality nor dosimetric information about each potential use.